This unique heirloom lettuce produces cylindrical, upright heads. The long, cupped leaves are medium to dark green, thick and crisp and have a sweet, mild flavor. This variety is highly prized and considered a gourmet delight. For the best flavor and development, plant the crops to mature during cool weather. Dark Green Romaine Lettuce (or Cos Lettuce) is a unique heirloom lettuce producing cylindrical, upright heads. 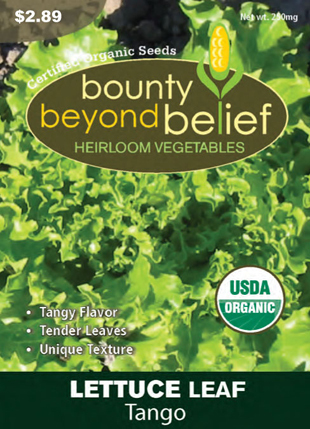 The long, cupped leaves are medium to dark green, thick and crisp and have a sweet, mild flavor. This variety is highly prized and considered a gourmet delight. For the best flavor and development, plant the crops to mature during cool weather. Dark Green Romaine Lettuce does well with beets, bush beans, pole beans, cabbage, carrots, cucumbers, onion, radish and strawberries in your garden or containers. You can also plant your lettuce at the base of young sunflowers for a little shade. Plant: Romaine lettuce will grow best when sown indoors in the early spring and transplanted to the garden in the mid-spring. Sow seed again in the late summer for a fall crop. If directly sowing into outdoor soil, cover the seed with 1/4″ (6mm) of soil. Care: Water plants regularly and fertilize when the are 3 ” (7.5 cm) tall. Provide light shade if planting in the summer. Harvest: Pick the outer leaves as needed, or cut the entire head when it is compact and moderately firm. Health: Lettuce is rich in fiber and a good source of potassium, Vitamin a, K and folic acid.